Thinking about God is a lot like thinking about organ donations. In 2008, behavioral economist Dan Ariely gave a TED talk in which he showed a graph comparing organ donation rates in countries throughout Europe. Morbid. But amazingly interesting when he dove into the numbers. Some countries, like Austria and France had organ donation rates of close to 100% while in similar countries, like Germany and the UK, rates were well under 20% – a fascinating comparison. What could cause such crazy discrepancies? On one end of the graph, scores were low and variable, while on the other end, the countries were maxing out at full participation. Even with the cultural differences between these countries, most were similar in size and all had overarching European socialist ideals. There really shouldn’t have been that much of a difference. Ariely gave a few ideas before finally discharging his theory. In all of the countries with the highest rates of participation, the organ donation program was opt-out. By doing nothing, the individual was enrolled in the program as an organ donor. In the other countries, their organ donation program was opt-in. By doing nothing, those individuals would not be enrolled in the program. Only after they checked a box would they get added to the list of organ donors. Surely, this can’t be it! Dan’s pretty adamant and makes a good case. There are a couple of really neat implications. First, Ariely says that, in both cases, it’s not that people don’t care. Instead, he attributes it to the the complexity of the question. When people are faced with complex questions – like those involving life or death or what to do with your various body parts in the event of a tragic car accident – people simply don’t want to think about it. It’s too big of a question to be reduced to a check box on an application. Faced with that kind of complexity, our default is to do nothing. When it comes to complex ideas, we just seem to accept the defaults. I used to believe that faith was an opt-in process. At some point, you were presented with a question about whether you wanted to follow Jesus and you had a decision to make. That decision was much more than just am I in or am I out? Think about it. By most accounts of faith today, opting-in is how you get to participate. If we do nothing, we are out. In order to get into the in-group, we have to check a box. Doing nothing means that someday down the road we would be sent to hell to burn forever. On the other hand, if we opted in, the choice seemed to be in favor of a mansion on a hilltop situated by streets of solid gold. On the surface, the question seems like an easy one to make. But there’s more going on here. By checking the box to get in, we agree to the implicit idea that the God who is orchestrating this entire thing is entirely too pissed off at the people he created but who he also knew would not check the box and would elect to go to hell anyway. Unless you’re in the 20% or so that would opt in, then damn you. Opting in is agreeing that God is angry and his wrath can only be satisfied by blood. It’s either yours or that of God’s own son. Someone has to die. It is an undeniably complex idea that most people simply ignore. They’re out. They’re doomed. It’s also worth noting that whoever designed or perpetuates this system wields a significant amount of power to influence what people do. How often will they come to church? How often will they volunteer? How much money will they give? I no longer believe that faith is an opt-in process. As much as getting a mansion on the hillside is compelling, the idea of spending eternity worshipping a God who is selectively compassionate towards the people who are supposed to be his children is more than a little off-putting. Much more compelling is the idea that God is the ultimate expression of love and inclusion – that there is limitless grace and mercy – that God welcomes people whether they spent his riches on hookers and booze or not (Voila! A thinly veiled Prodigal Son reference). I want a God that can be a model of caring – a God that is loving by default. That’s a God whose love you have to opt-out of. Don’t be fooled – opting out of an infinite amount of love is also a complex undertaking. You might not believe that there is a personified god in a mystic place called heaven. You may not believe that such a god intervenes in our lives to heal diseases or find parking spots close to the door. Opting out is effectively saying that you don’t want to believe in the idea that there is goodness and compassion at the heart of the universe. Sure, you can opt out. But most people won’t. And when most people don’t opt out, it changes the whole culture. It changes the types of questions we ask. It changes who has power. It changes ideas about God and judgement and guilt. It is an equally complex idea but the idea that everyone is in has an impact on how we live our lives, how we treat others, how we think about things like competition and disagreement. I don’t claim to know what God is or how to describe the idea using any sort of language. What I do believe is that, whatever is out there, it is most compelling when it is open, and accepting, and loving. How do our ideas about God change when we believe that everyone is in by default? Who stands to lose power or money or control if this were the dominant view? 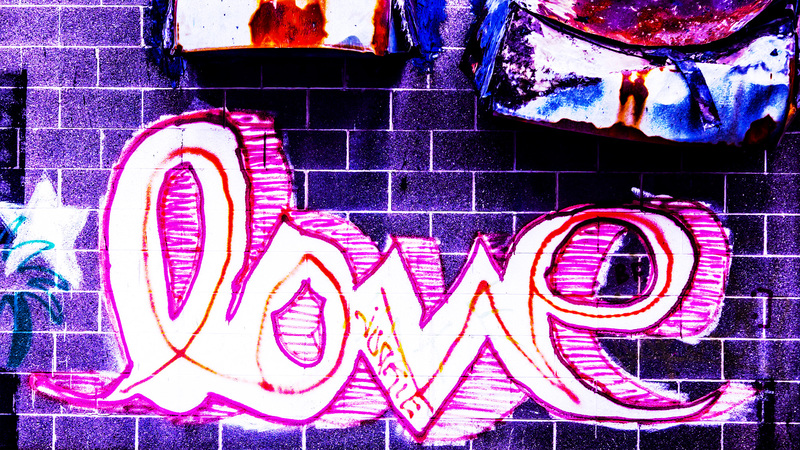 Photo Credit: “Love” by Thomas Hawk is licensed by CC BY-NC 2.0.